Admit it. You’ve always wanted to design a watch. Designing your own watch is better than buying Breguet or Patek because your watch is fashioned out of your imagination. Colors coordinated just the way your mind’s eye has always seen them. A band that matches those colors. Such a watch would be truly yours and there would be no other watch like it. The only things standing in your way of designing a watch are years of watchmaking school, followed by decades of apprenticeship. Oh, that. Should you forget your dream, then? Forget ever making a watch that looks exactly the way you want it? I’m here to tell you that you can design a watch that looks like the one you imagine yourself wearing when you star in a James Bond movie. You can make the watch of your dreams. other watch in your collection—or in the world. Let’s get to the nitty gritty of what you can and cannot design. We’re not talking about something that’s the love child of a Rolex Submariner and an A. Lange & Sohne Grand Complication. You’re designing a 45 mm Boccia watch that uses a Miyota quartz movement, has a titanium case, and is water resistant to 330 feet. That’s your base. Here’s how you design your watch. Visit the Boccia Configurator page. On Boccia’s website, first choose between a three-hand watch or chronograph. Then, select the color of the bezel, hands, strap, dial, and subdials (for the chronograph and decide whether you want a mineral or sapphire crystal. Depending on the watch part you’re choosing the color for, you’ll be picking from among 19 to 33 different colors or color combinations. All told, there are millions of design possibilities for each Boccia watch. Boccia watches aren’t Omegas or Audemars Piguets, but it’s still pretty cool to be able to design a watch that incorporates your favorite colors—including in the band—the way you want them. You can go back and forth and modify as much as you want, changing the color of the hands this way, then the color of the dial that way, then the bezel’s color another way. Remember, there are millions of possible combinations, so you could at this for a very long time. It takes three days for Boccia to produce your watch once you’ve submitted the order. That’s probably a lot less time than it took you to decide what to make. You can view an image of what your watch is going to look like before you place your order, too. 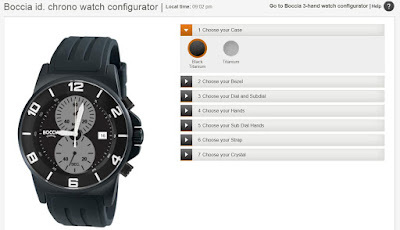 Boccia makes it easy to design your watch. The hard part is choosing from among the millions of color combinations. I recommend designing a watch that’s different from every other you own. If every timepiece in your sock drawer has a white face and brown leather band, now’s the time to make something unique. 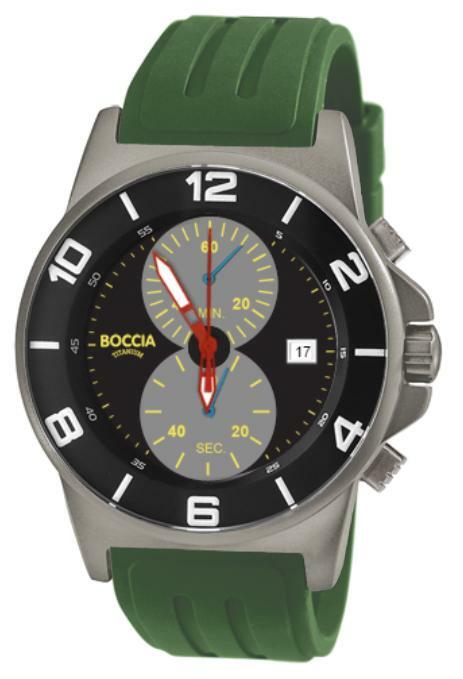 Three-hand Boccia watches cost $145 and chronographs cost $225. That’s not a bad price at all for a watch you design and that will probably not have any twins anywhere in the world. Have fun with it.